They say there is no evidence so far that anything else explains the benefits seen - but the large study will look into that even further. Another study has also identified the biological process whereby beta blockers stop cells moving - and therefore stop cancer from spreading. 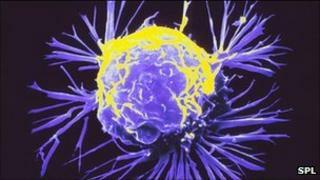 He said: "Cancer can be thought of as having two distinct phases - before and after the disease has spread. "Many women will be successfully treated for their initial breast tumour but in some, the original tumour leaves a legacy - a daughter of the primary cancer. "It is absolutely crucial to conquer cancer spread if we are to really improve breast cancer survival as this problem causes nearly all deaths from the disease." Dr Julie Sharp, senior science information manager at Cancer Research UK, said: "As beta blockers are already a known drug this could be a very interesting development, which has the potential to save a large number of lives."